Learn To Deal Poker Today! You can make good money dealing poker, but only those dedicated to learning the fundamentals of poker dealing are the most successful & make the most money. Are you really poker dealer material? Don't go any further until you've read our free report "What It Takes To Deal Poker". Would you be a good dealer? Click to view Dealer Training Student video. VIDEO: Can You Deal Poker Like This? Neither could Travis, until he enrolled in Dealer Training. Watch him go to work dealing this hand of Texas Hold'em, as eager poker players patiently wait until a thorough dealing process has been completed. 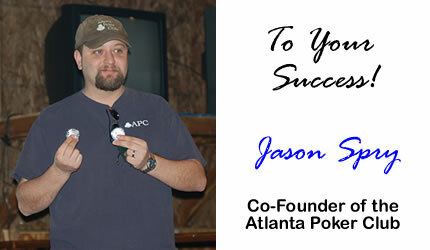 My name is Brad Fuller, co-founder of the Atlanta Poker Club, a pub poker league, which plays poker for points, prizes and prestige all over Georgia. As luck has it, one of the very first players in the league back in 2004 was a professional casino poker dealer who had previously dealt at the Bellagio in Las Vegas. The Bellagio is well known for having some of the best poker dealers in Vegas. With her help, we created Dealer Training (Dealer-Training.com), the internet’s only online, home-based poker dealing course. One of the first challenges we faced with the Atlanta Poker Club was that we needed really good dealers. A player doesn't tolerate incompetent dealers and neither does the APC. But when we looked up the prices to send dealers to a land based poker dealing school our mouths hit the floor! We were shocked by how expensive the poker dealing schools are! There was absolutely no way we could afford to attend a live poker dealing school with the cost of tuition, travel, hotel, food, etc. We needed an inexpensive, yet thorough, dealer training solution and we needed it fast. So, we created the Dealer Training program from square one. It now allows aspiring poker dealers from around the world to learn how to deal poker fast and easy, from the comfort of their home. Dealer Training is the easiest, fastest & most cost effective way to learn to deal poker like a pro! When we met Tami D., she was a Bellagio Poker Dealer who just happened to be living in Atlanta at the time. She was on hiatus from casino dealing and actually wanted to deal in our poker league games to keep her skills ‘fresh’. Tami showed us how Bellagio poker dealers deal poker. It is way different than the dealers in the local home games we normally play in. She showed us how to deal both tournaments and cash games with a focus on the most popular poker game, Texas Holdem. We knew we needed a way for Tami to train all of our Atlanta Poker Club dealers so we began working with her to create what became Dealer-Training.com, The Professional Poker Dealing Course. It is a one of a kind online poker dealing school that we use to train APC dealers to this very day! 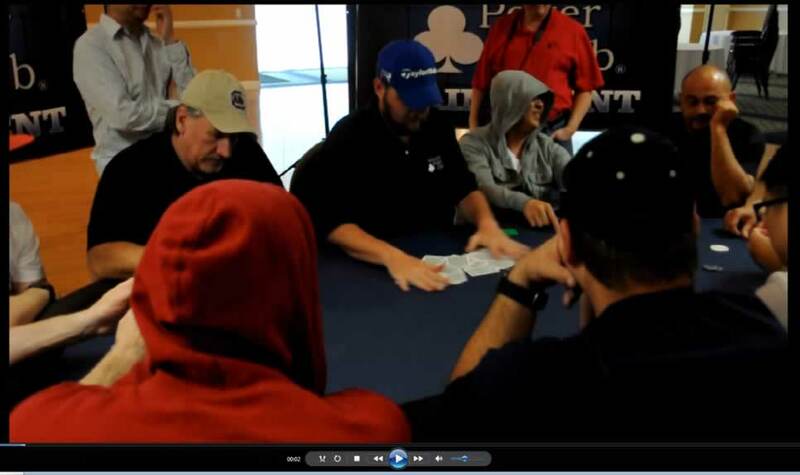 Our dealers learn to deal Texas Holdem, Omaha, 7 Card Stud and other games like a pro, from a pro. The better poker dealer you are, the more you get paid, period. With this poker dealing course you can learn to deal from one of the best for a fraction of the cost of land based poker dealing schools. What about the economy? I know poker was hot when Chris Moneymaker won the World Series… but are people still playing cards today? Historically, gambling has always been extremely popular and people will always find money to do a little gambling with. Live tournament poker fields are having record entries, and poker leagues like the Atlanta Poker Club are springing up all around the country and growing in volume. People love to gamble, plain and simple. Regardless of how the economy is doing people find money to play poker with. Dealing texas holdem is a great part time job opportunity. You can quickly make some “pocket money” so next time it’s your turn to buy your friends a round of drinks at the bar you do not have to put it on the Visa or stress out about if the card is going to clear. Lean how to deal texas holdem like a pro and you will have a skill you can use to make money virtually on demand. Every city, town, suburb and neighborhood across the USA and growing around the world are running poker games every night of the week and the players crave professional dealers! Plus, most dealers say they enjoy dealing poker! Wouldn’t it be cool if you actually had fun, or improved your own poker game, while going to work? It does not matter whether you’re looking to deal for your friends, local tournaments, or under the bright lights of Vegas or Atlantic City, our home based poker dealing course has provided results time and time again for many hundreds (if not thousands) of poker dealers, and it will do this for you. Let Me Share a Secret With You . . . If you are already a poker player and are looking for a way to supplement your bank roll then there is hardly any better time spent than that of the poker dealer. Aside from the fantastic income potential that poker dealing offers, it’s drop dead effective for improving your own poker play because you get to see so many hands from an impartial, unbiased view point. And you can use that information to improve your own game, as well. Not many people know that two-time World Series of Poker champion Johnny Chan, or Layne Flack (who has total winnings of over $4.2 million dollars as of 2008) were professional poker dealers before going pro in the poker leagues. In fact, in the 2004 WSOP No-Limit Event, all three players were former dealers! Scott Fischman, a player in that game, even admitted to learning to deal strictly for the sake of improving his poker play (I’m thinking he didn’t mind the extra bulk in his wallet, either). Unfair Advantage at the Tables? Look, it doesn’t matter how many books, charts, theories, and other technical poker knowledge that you consume; there is no substitute for table experience. Imagine getting paid several hundred dollars a night to be right in the middle of the action, discovering how to spot tells, put players on hands, and fine-tune your reads to an almost psychic ability – all without risking a dime from your pocket . . .
And of course maybe there’s the possibility that you have no interest in playing poker, and are just looking for a fast-paced, high-paying work experience – and there’s nothing wrong with that. Back in April of 2004, when we were just about to open the doors on the Atlanta Poker Club, we needed to score top-notch dealer training. And so we tracked down one of the Bellagio’s top dealers, Tami D., and were able to enlist her services to create our one of a kind home based poker dealing school. packaged it into a course called Dealer Training. Needless to say, the Atlanta Poker Club has become a raging success, thanks to the professional caliber of our poker dealers, and we’re proud to say that the exact same course is now available to you. Why pay the thousands of dollars it takes to go to a land based poker dealing school? Packed full of videos, professional photo’s and comprehensive chapters covering in detail everything you need to know to deal poker as a professional. We designed the course to quickly you teach you the casino poker dealing standards, techniques and how to’s. It’s a fair question, so I would like to break it down for you. A professional poker dealer can average roughly 35 hands per hour depending on the game they are dealing. Limit games go faster while no-limit games generally take a little longer per hand on average. Most dealers are paid via tips, usually from each hand dealtl. Dealing 35 hands per hour at $1 tip per hand then it is going to take roughly three hours to earn $100 dollars. Bigger tips increase your earnings exponentially. Now we are talking sometimes up to $50, $60 or even $70 more per hour in your pocket. In an average $1/2 game many dealers make over $250 of cold hard cash for an evenings worth of work. Money in your pocket money, too. And you do not have to live near a casino to make this kind of money dealing poker! Here’s just a taste of what’s included in Dealer Training . . . Poker Dealer Tricks of the Trade – Devestatingly simple tips and strategies to make dealing poker easy and efficient. 400 + Photo’s Every technique, captured in painstaking detail. Perfect form laid bare before your eyes. 10 Chapters covering the entire poker dealing process. Running the gamut from start to finish on dealing a hand of poker. 10 Practice Lessons to hone your skills – Simple and entertaining ways to commit your new-found poker dealing skills to muscle memory. 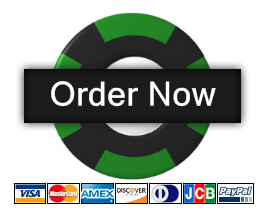 List of quality poker dealing supplies – What you need to deal poker, and where to find it. How to find a job in or out of a casino – No matter your desire, we’ll show you how to uncover the best opportunities and get the work you want. Bonus chapter on making extra money while you deal. Battle-tested techniques that will have your players singing your praises, while also lining your pockets. Will Do For You . . .
How to shuffle the right way. The exact process for a true random shuffle that is not only devastatingly efficient and effective, but most importantly, to actual casino standards. How to sort side pots accurately and quickly. A fast and easy technique that lets you calculate multiple side pots quickly and easily and it is 100% accurate. Even if you almost failed math, you can do this! How to calculate and take a rake. An easy way to calculate the rake, and examples of casino rake schedules. How to pitch the cards. Pitch quickly and accurately with this casino method. How to cut, count and manage chips. Handle and count cheques like a champ once you learn the easy-to-follow process. Where to put side pots, and how to award them. A no-brainer method to ensure that your side pots are awarded to the right person every time. How to handle misdeals and what causes a misdeal. What constitues a misdeal, how to declare a misdeal and more importantly when to not declare a misdeal. How to handle a hand from start to finish. Follow the professional poker dealer process to efficiently deal poker and you will make more money. Want to see an example? Check out the video sample below! Good question. One of the most unique aspects of Dealer Training is that it’s a 100% online course. What that means: No matter if it’s 2pm or 2am, you can order Dealer Training at any time and you’ll receive immediate access. What’s even better is that because of this 100% online nature, you’re able to complete the course at your own leisure. In addition to training at your own schedule, our program allows you to repeat any training modules as many times as you may want or need; something that’s just not an option with land-based training. No hidden or additional fees . . . EVER. You see, not only is Dealer Training available for 1/6th of the cost of tuition at a land-based school, you’ll never have to worry about paying a single additional cent outside of the original cost. No monthly fees, no “upgrade charges,” nothing. And speaking of upgrades . 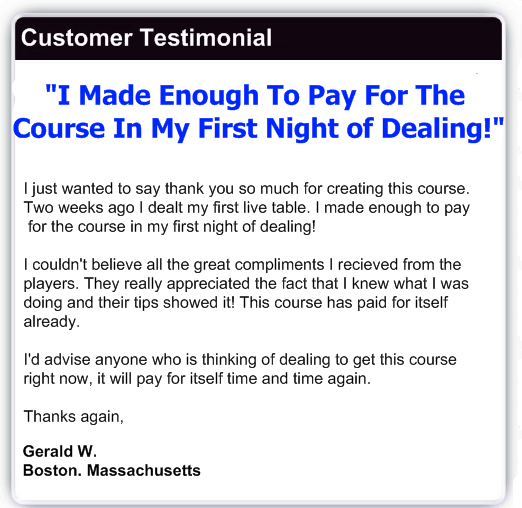 . . Any future upgrades to the Dealer Training course will be provided to you absolutely free of charge! Considering that tuition for the average dealer training school starts at $1200 (then add on travel expenses, accomodations, and time spent away from work), surely offering you a program led by one of the top dealers in Vegas… one that you can follow along with at home, at your own pace… could easily sell for as much. We’ve decide to offer Dealer Training for only $197 only $97! That’s $120 off of the price we’ve sold it for since 2004! Here, let me break it down for you . . . Earlier I mentioned how a professionally trained dealer can deal an average of about 35 hours an hour, can expect a minimum of a $1-2 tip per hand, and to work around a 4 hour shift . . . Using those numbers, we’re talking about $175-$350… In other words, it is possible to cover the cost of this program in your first night of dealing! Not Sure? Let Me Shoulder All of The Risk . . . If you’re ready to start dealing poker like a true pro, then click on the button below to secure your access to Dealer Training! Yes! I’m ready to receive immediate access to the Dealer Training program for only $ 97 (limited time only, normal price is $197). I understand that I have 8 full weeks to review the course and if at any time I decide that it is not right for me, I may simply request a refund, for any reason whatsoever (or for no reason at all). 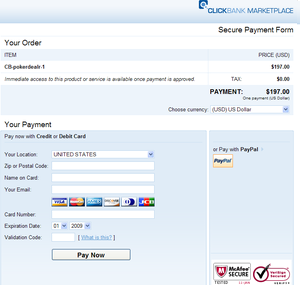 My order will be processed by ClickBank, the world’s largest payment processor of online goods. ClickBank’s secure ordering process is tested by McAfee, as well as Verisign, to ensure total privacy of my information. It is on this basis that I’m ready to order Dealer Training now! P.S. I know this course will teach you how to deal poker at a professional level because I see it again and again from the dealers within the Atlanta Poker Club. 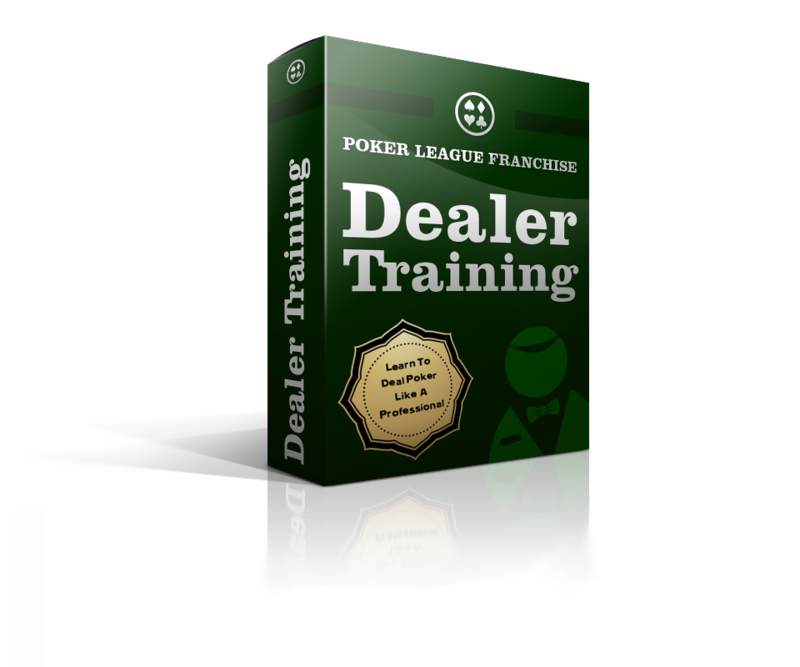 Join the thousands of others who have learned how to deal poker like a pro with Dealer-Training.com. The price of the course is usually $197 and will be most likely be going back to up in the next few days. If you are un-decided, go ahead and order the course now at the 60% discount price of $97. I 100% guarantee your satisfaction or a full refund within 60 days, no questions asked. I know it gets results, because I see them time and time again in the quality of our own dealers, and in the prestige and recognition they receive for their excellence. So whether you’re looking for an exciting, high paying career opportunity, or you want to use poker dealing to springboard your poker playing abilities, this is the right program for you. There is no risk, as you have 60 full days to review Dealer Training and make sure that it’s right for you… If you’re unhappy, or for any reason at all, simply ask me to refund your money and I’ll make it so. So order today, and I’ll see you at the tables! © 2019 Dealer Training, All Rights Reserved.